Should I Go To The Doctor To Get Checked For Injuries? What Information Should I Gather After the Accident? There are many issues which arise the moment you become involved in an automobile accident. These issues range from what to do at the scene of the accident to whether or not to contact an attorney. Often, the decisions that are made at these critical times can be the difference in whether or not you receive any recovery as a result of the accident. The first decision immediately after the accident must involve safety issues. Make sure that you and your passengers are safe from further injury or damage. This involves assessing the accident scene to make sure that the vehicles are stopped in a safe place and to make sure there is no potential for fire, explosion or further accidents. The next most important step is to check yourself, your passengers and the other driver for injuries. If at all possible avoid, moving injured persons. If they have sustained certain injuries, like a broken neck or back, moving them could cause permanent or worsening of their injuries. However, if the car is about to catch on fire, you may have to risk further injuring a person to save their life. Oncoming traffic should also be alerted that an accident has occurred. This can be done with road flares or other signage. Engaging emergency flashers, lights and even blowing the horn can be effective ways to signal oncoming traffic. Call 911 from a cell phone or other available phone. Make sure that you speak clearly and calmly and give as much detail as possible, including relevant landmarks, so that the appropriate emergency vehicles can find your location without delay for wrong directions. Obtain information from all other involved drivers, passengers and witnesses. Frequently, witnesses will initially stop at the scene and then leave before the police arrive. The identity of those witnesses may be critical at a later date. 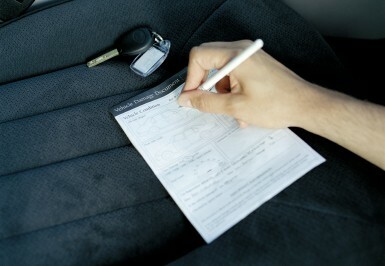 The other driver’s insurance information is also important information to obtain. After the accident, it is important to get a medical checkup. This is true even if you do not believe that any injuries were suffered. Often, back and neck symptoms appear days after the accident. When such symptoms occur, you should seek immediate medical attention. An insurance adjuster may contact you after the accident. Although it may seem like a good time to tell your side of the story, giving a formal recorded statement could be the reason why something is taken out of context in an effort to deny you recovery. However, that does not necessarily mean that in all circumstances that you should run out and hire an attorney. There are situations that can be resolved without the need for an attorney in a fairly rapid fashion. There are many different factors to consider when you are involved in an automobile accident. Any one of these could be the difference in recovering or not.